Last month I had the pleasure of meeting and conversing with Bridget, the owner of one of L.A.’s better bridal boutiques, En Blanc. I’d been interested in meeting Bridget since she first opened En Blanc a year ago - I was actually intrigued by her unique approach to helping brides find their gown: in addition to providing a traditional bridal shopping setting, Bridget offers private gown consultations outside the boutique, in the comfort of the bride’s own chosen space. You can read all about it here! What really stood out me about Bridget was her warm personality and how easy she was to talk to. Bridget showed me around the showroom, a beautiful loft that epitomizes the cool SoCal aesthetic and laid back vibes. 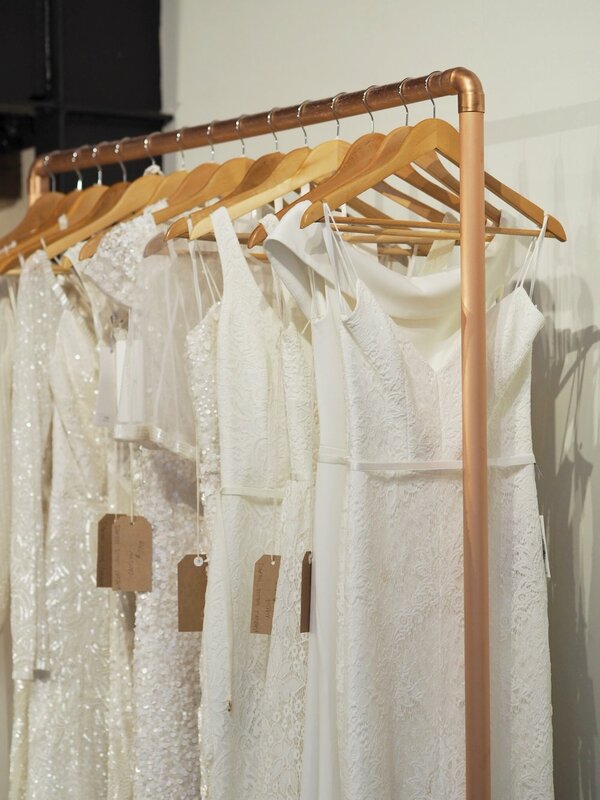 I was also impressed by the carefully curated selection of brands and gowns Bridget has in her store - a selection that does not overwhelm in the least but which contains a gown for every bride, from formal elegance to casual boho. Meeting Bridget and touring her showroom was fun, but more importantly, seeing just how knowledgeable she is about her target customer - about what it takes to create that important experience for a bride who is not just digitally connected but also brand savvy, and who expects a flawless bridal shopping experience - I have to say, En Blanc is among the best out there. Read our interview with Bridget where she discusses everything from how she got into bridal to her 2019 trend predictions! How long have you been in bridal and how did you get into it? En Blanc opened a little over a year ago. I started my career in women's ready to wear and fell in love with bridal over 15 years ago. After years of talking about opening my own shop, I finally decided to pull the trigger and open doors last January. I opened En Blanc because I saw a lot of opportunity out there to create a special experience for our brides, one with which they could feel completely comfortable and joyful. We're buying for our modern coastal California bride and putting a strong emphasis in style, comfort, wearability, and femininity while keeping in mind the lifestyle of our SoCal brides. What does a day at En Blanc look like? Our days are cheerfully met with our brides-to-be and we couldn't be more grateful for getting to work with these beauties every day. We feel so humbled and thankful that our brides choose us to be a small part of their big days! Our appointments are one-on-one with a personal stylist and give our brides a full hour and a half to discuss her vision and select her special gown. Her space is her own and her time and attention is completely undivided, allowing our stylist to really hear our brides and pay close attention to their vision. We have fun, provide bubbles, and create an intimate and personable setting for our brides so they can feel relaxed and comfortable while celebrating in this special moment. What is your process in selecting what you’re adding to your collection of gowns? Our gown selection begins with listening to our brides. We pay close attention to what they're loving in bridal right now and try to keep our samples fresh, new and fashion forward. We buy twice a year and have new inventory coming onto the floor daily. We allow our brides to have full exposure to what we currently have in the showroom by updating our website daily with all of our samples and informing our bride when new dresses have arrived. We spend a lot of time and energy in selecting what comes in our door and make sure that each dress fits with the various bride we often see here in LA. Who is the bride that shops at En Blanc? The En Blanc bride is stylish. She is fashion forward in both clothing and design. She is informed and knowledgeable about what she likes, and confident in her style. She is coastal, edgy, cool, confident and FUN. She values fabric, lines, embellishments and design elements that we pay close attention to here at En Blanc when selecting our gowns. She is beautiful inside and out and we are LUCKY to have her as En Blanc brides! What are some the trends in bridal you're loving right now? For 2019, I'm seeing a lot more embellishments than before, a lot of pearl ( which we absolutely love), extra long veils, a move away from strictly bohemian to a more luxe casual look. We're seeing accessories brought into bridal looks more including everything from embellished birdcages to silk tulle slouch socks socks to complete your look. At En Blanc, we're staying true to our love for timeless gowns while also giving attention to bridal trends we're currently seeing and bringing both into the showroom. They often play off each other really well! Do you have any trend predictions for 2019? Some trends we're predicting for 2019 include bridal hairstyles with a lot of ribbon involved, geometric alters and geometric open space ceremony venues, more and more pearls, more asymmetrical back detailing which we LOVE! We cannot wait to meet you all and have you as our next En Blanc bride!